I read your Eight Tips for Travelers and in tip number 2 you mentioned this: “Optionally, if you’ve brought a laptop and have an additional wireless device—an iPad, for example—create a wireless network on your Mac that you can share with your iPad.” How would I do this? 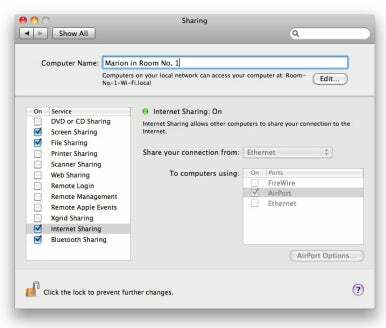 You do this via Internet Sharing and it works this way: Plug an Ethernet cable into your MacBook and establish a connection (at hotels this generally requires firing up your browser and logging on to the hotel’s home page). Now open System Preferences and choose the Sharing preference. Select Internet Sharing and choose the AirPort sharing option. If you like, fill in a network name in the Computer Name field. Check the box next to Internet Sharing to switch it on. The AirPort menu, which usually sports a fan icon, will now show a gray fan with an upward-pointing arrow. This indicates that the MacBook is sharing its Internet connection. Now grab your iOS device, tap Settings, tap Wi-Fi, and you should see the connection shared from your laptop in the Choose a Network area. Select it, wait a bit for your device to connect to the network, and have at it. Should your iOS device have difficulty connecting to the network, return to its Wi-Fi setting, tap the blue arrow next to the temporary network you just created, and tap Forget This Network. Return to the Wi-Fi screen and connect again. Sometime you have to issue this kind of tiny kick upside the network to establish a connection. Of course this technique isn't limited to sharing the connection with iOS devices. Your laptop has just become a wireless router and is available to any device capable of working with it—the laptop of the cheapskate co-worker unwilling to pay for their own bandwidth in the next room, for example. For this reason, you may want to protect this network. You do this by clicking the AirPort Options button at the bottom of the Sharing window, enabling the encryption option, and entering a password. Anyone wishing to use this ad-hoc network will be prompted for the password.